The album opens with an intriguing “Atlantic Drift,” a powerful piece that combines jazz piano, sax, bass and percussion with a much more classical cello. It’s amazing how well this juxtaposition of genres works! “Marty Feldman Eyes” is the most unusual song-title I’ve seen in a while, and the piece is joyful and energetic with infectious toe-tapping percussion, piano, trumpet, clarinet and cello. Although the cello tends to be more soulful and grounding than the other instruments, Helen Thomas shows that she can groove with the best of them! “Creole Dance” is a piano solo played on an antique Steinway Model O grand piano. A little bit Baroque, a little bit Latin, it’s dramatic, passionate and fun. “Black is the Colour of My True Love’s Hair” is a “cool jazz” arrangement of a traditional folk song. Vocals, piano, bass, drums and clarinet bring this classic up-to-date. The almost seven-minute “Lviv Sunday Morning” begins as a dark, minimalistic piano solo. The cello enters with rather spooky counterpoint before the piano becomes more flowing and lyrical. The piano and cello then dance around each other, still in a fairly classical mode. The second movement remains dark and dramatic, but is much more rhythmic with the addition of percussion and bass. The third section is primarily a piano and cello duet, and then the bass and drums return for a lively closing section. “Two Part Invention” gives ol’ JS Bach a nod, but this piece is mainly straight-ahead jazz with piano, and most of the ensemble (no horns) - a favorite! “I Beg to Differ” opens with a very dark piano solo that segues into a Latin-flavored slow-jazz piece with a strong groove. Over its six-plus minute playing time, all of the musicians have a chance to stretch out and solo. I really like this one, too, but my favorite piece on the album is “The Open Road.” It opens with an upbeat Latin flourish that becomes a lively song that reminds me of Leonard Cohen with poetic lyrics, husky half-spoken vocals and brilliant musicianship. “Dance, dance, dance. Take me to another town. Dance, dance dance. The cheap fare to turn my fortunes ‘round.” What a great song to end this unique and fascinating album! Check it out if you like a mix of genres that create a distinctive and original sound! 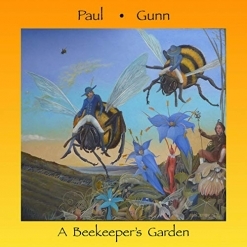 A Beekeeper’s Garden is available on Bandcamp, Amazon and iTunes.